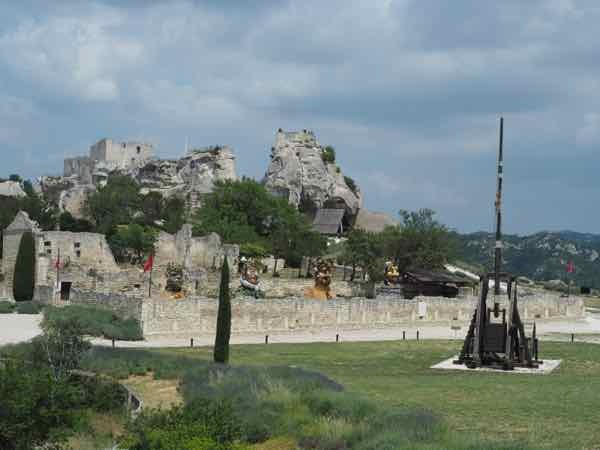 I have some advice on visiting the chateau at Les Baux in view of the terrain and design of this famous fortress. 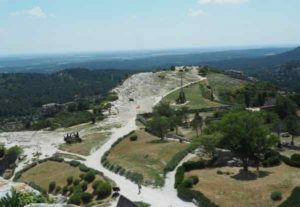 And the first piece of advice is: visit Le Château des Baux de Provence while you can —-that means now—-because you’ll be climbing up many old, uneven steps and walking on gravel to get the best views. 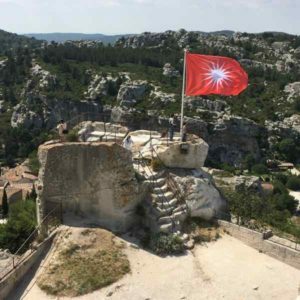 Visit Le Château des Baux de Provence While You Can Because…. Friends and acquaintances would often say I should do active forms of travelling (ie. hiking, kayaking, and biking) while I am young. It never really occurred to me how wise their advice was until I started seeing my parents use canes and walkers. 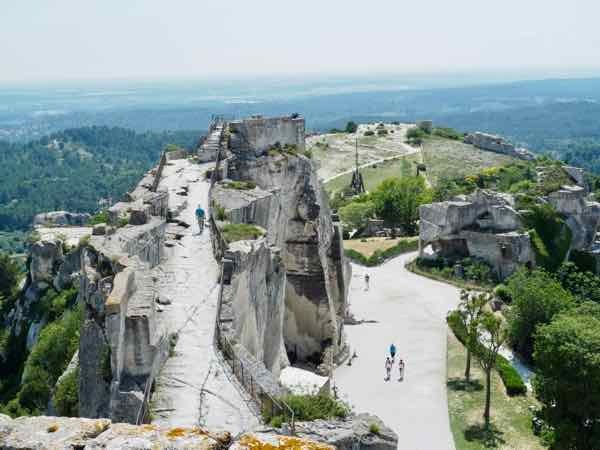 And when I visited Les Baux in Provence recently, what struck me was how difficult it is to explore many of these sites if one is quite a bit older or if one has mobility issues. I made a comment to another traveller about the difficulty site-seeing for those who are elderly and for those using walkers our wheelchairs. She just shrugged. (No, she wasn’t French). 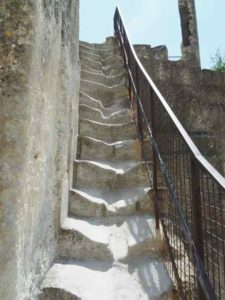 It made me feel sad for those who are unable to climb the many steps or navigate the uneven stone paths at the famous Le Château des Baux de Provence. 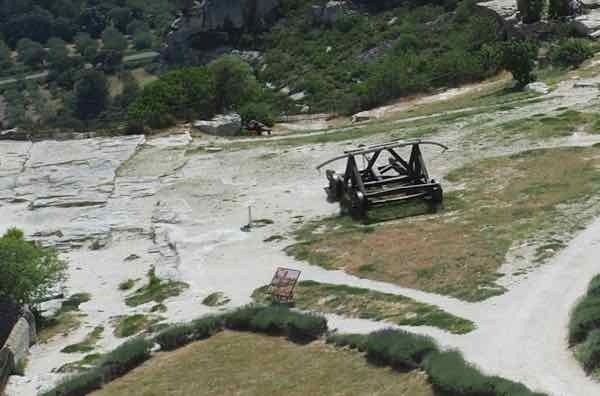 This site is in the town of Les Baux-de-Provence which is designated one of the Plus Beaux Villages de France, and sadly, the upper parts of the chateau (which have the best views) are just not accessible for those with mobility issues. I am not writing this post to complain. In fact, I found Le Chateau to be quite an impressive site. 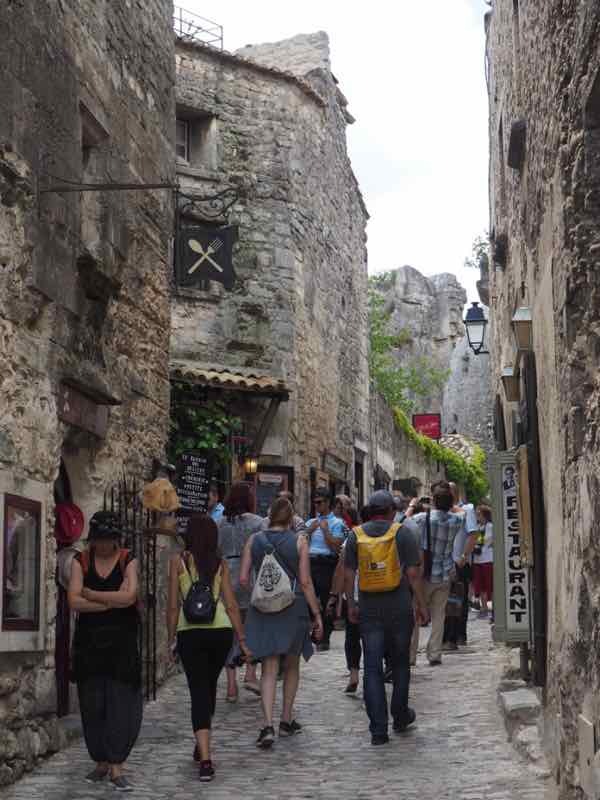 My parents took me to Les Baux for the first time in 1978 and I have since returned 3 or 4 times. Back in 1978, the Chateau was truly in ruins and I don’t think any mobility aids could have been used. Fortunately, each time I visit, the whole area has been updated and modernized. There are many more paths that wheelchairs and walkers can use. In summer there are often art exhibits and medieval demonstrations. 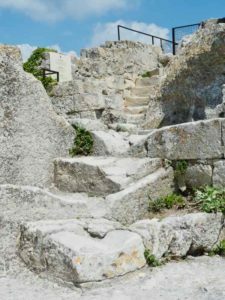 But to access the highest points at Les Baux, one must climb and navigate some rocky paths and stairs. 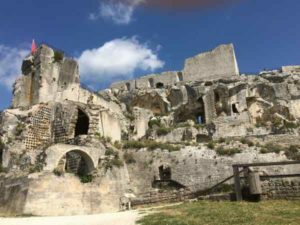 Here are some of the things to see and a little background on what has Les Baux one of the premier places to visit when you are in Provence. 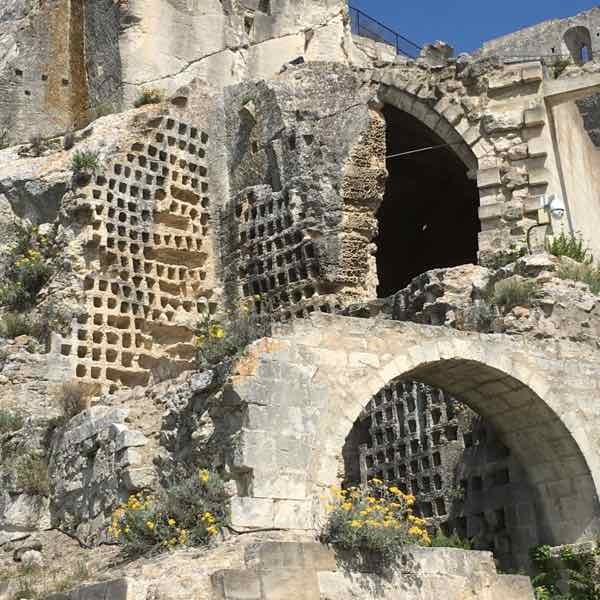 It was in the 10th century that the House of Baux became known. 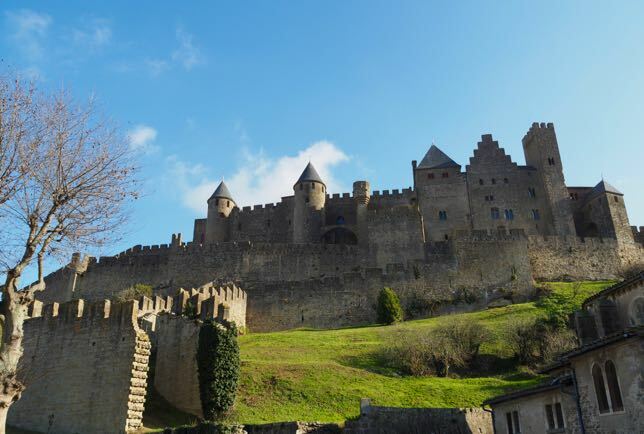 They were a powerful family in the region of Provence that demonstrated its power by building the chateau— a fortress that through the centuries was at war and under siege many times. 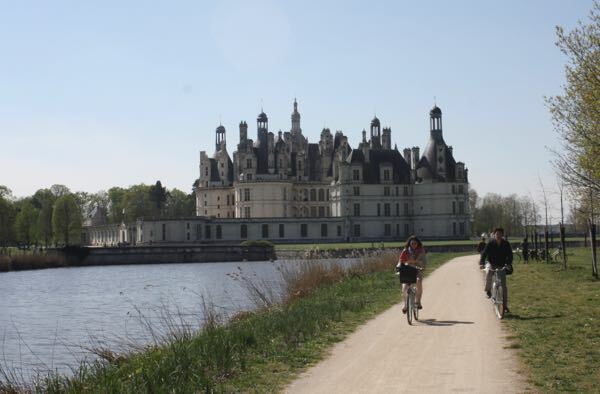 There was constant fighting between rebels and royalty and while the chateau was destroyed a number of times, it was also rebuilt many times. However, in the 1600s, the royals had had enough with rebellions and the chateau was destroyed once and for all. From May 19-September 30, 4 giant heads (sculptures) will be on display. 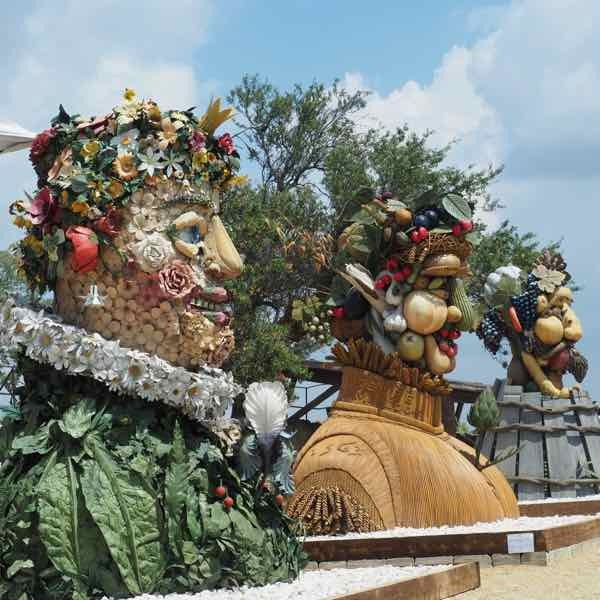 These are the works of art by American artist, Philip Haas, and represent the four seasons, paintings inspired by Giuseppe Arcimboldo. They are enormous (more than 15 feet tall) and definitely stand out against the stark terrain of Les Baux. In the spring and summer, there are often demonstrations of how these weapons were used with knights in armour and jousting competitions. In 2009 a reenactment of the siege of the chateau involved over 1000 participants. Le Trebuchet was a siege weapon and it was certainly one of the most famous weapons. Designed like a catapult or sling, its levered arm could propel rocks weighing 50-100 kilograms over 200 meters. The Battering Ram was used to smash into fortress walls and crack them, in hopes that the wall would collapse. The ram would move back and forth, moved by soldiers. They were protected by a roof which was made of animal hides and mud. The Ballistra was another catapult-like device that could project rocks or items weighing 20 to 60 pounds on fire. Being attacked by fire was especially onerous as there weren’t fire departments in medieval times that could quickly put out the fires. 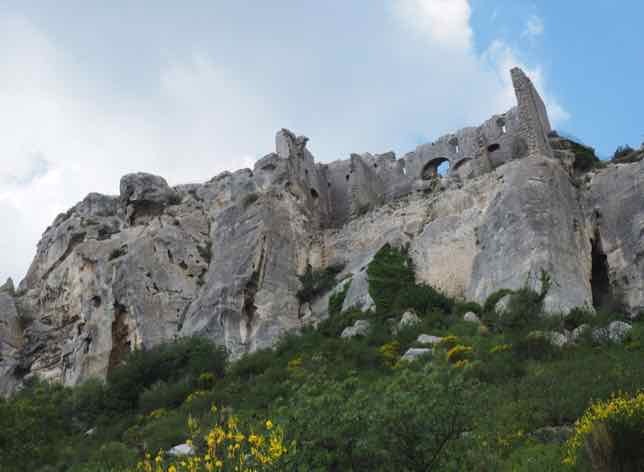 Les Baux sits on a cliff in the Alpilles mountains and it provided the ideal location to spot oncoming attacks. The château’s highest point was the keep, carved out of the existing rock and difficult for attackers to scale up to the top. Today, climbing to the top is worth the trek, if you are able to navigate the worn stairs and rocky terrain. The Sarrasine and Paravelle towers were constructed on either end of the château and had arrowslits to watch over oncoming attacks. Dovecoat: In medieval times, pigeon meat was a for the rich and at Le Château, this dovecote contained over 2000 nest holes. Throughout the ruins you can see the remains of the chapel, the ovenhouse, courtyards, and houses (troglodyte houses carved into the rock). 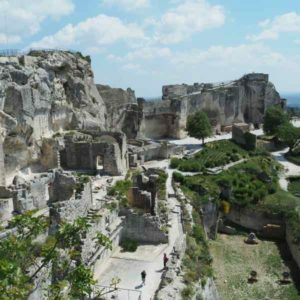 So I suggest you visit Le Chateau des Baux de Provence while you can. It can be rocky and very hot in the summer, but it will be worth it. Great advice, Jan. The views from the top of the château are fabulous but can be tough to get to if you have mobility issues. 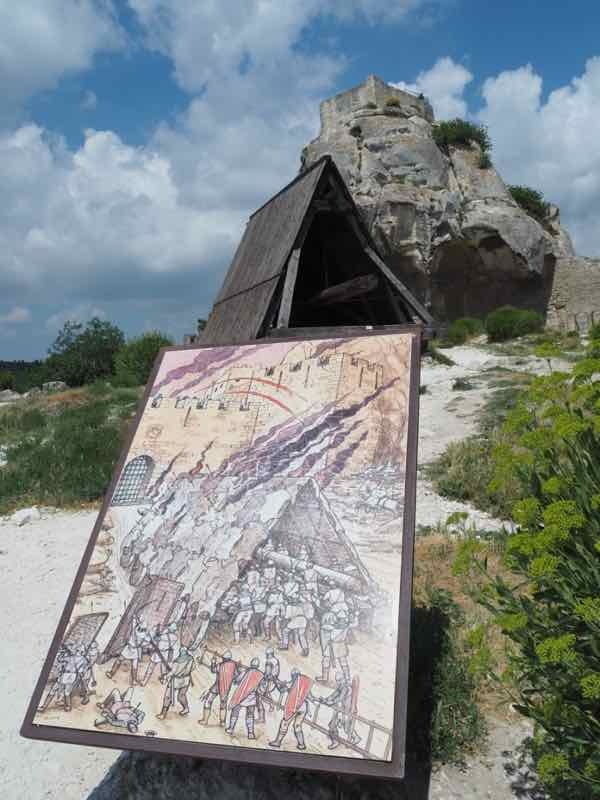 Fun fact: Some of the world’s first bauxite mines (bauxite is a kind of rock) were in the region around Les Baux. Bauxite is then processed to get aluminum. And where does BAUXite get its name? Think about it! Very good point. Thanks for sharing that. 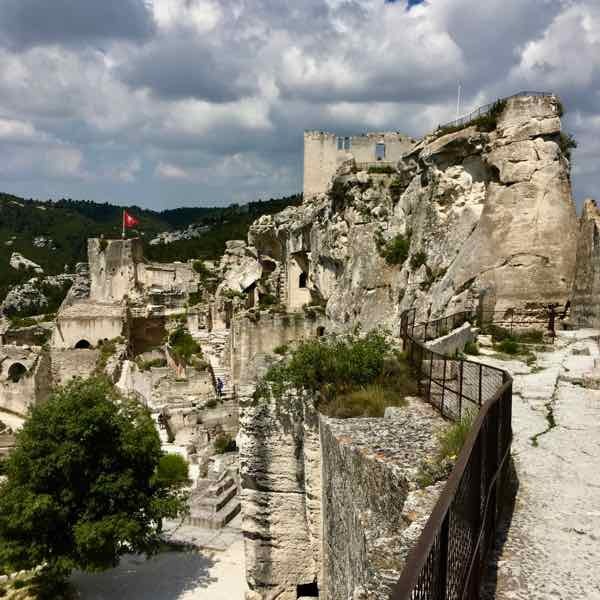 Looks like a visit to Le Chateau des Baux de Provence is totally worth the effort of a visit and what an awe-inspiring location high above anyone intent on gaining access. Your photos are great and I love the one of the dovecoat especially – looks like they ate like kings! Your point of traveling while you can is important as my husband has respiratory issues which now makes climbing or walking long distances difficult. Things that are easy to those with no health or mobility issues can present insurmountable odds to people with those issues. You don’t realize how important health and mobility are to visiting many of the world’s most awesome destinations until you look at it from the point of view of someone who has difficulty accessing them. You’re right. You certainly don’t realize it. So often we take our health for granted.